Mid-century architecture and wine. Two of my favorite things. And they've thrown in cheese. Another fave. 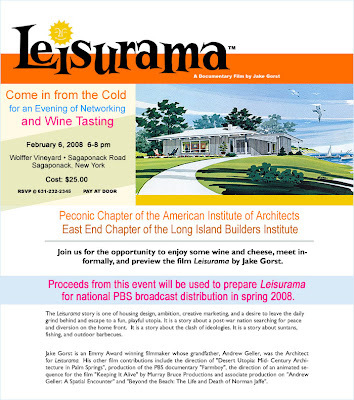 Then there's a personal house connection - the architect of the Leisurama homes was Andrew Geller, who designed our house. Plus I've been desperate to see the film since I first heard about it. It sounds like pretty much everything I want from an evening's entertainment. And of course I can't go. I could go if I was sure I wouldn't cough all the way through it but I've attended enough concerts, plays and speeches to know how super freakin' annoying it is when someone starts hacking and how much I've longed to pelt them with Halls Mentholated Cough Drops when they JUST WON"T STOP. So this is payback for my years of intolerance. Karma caught up with me. I guess I'll have to catch it when it airs on PBS, just like everyone else. Sob, cough, snivel.